In making all the selections for your new kitchen, one of the last decisions is selecting the kitchen sink. Choosing a kitchen sink should not be complicated, should it? Let’s consider some of the variables in choosing a new kitchen sink, including sink configuration, types of sinks and the sink materials. You want your kitchen sink to look beautiful, to be functional with low maintenance and to be made of durable and high quality materials. These characteristics can be found in many types and brand names of sinks. Sink Configuration: You want the size, shape and depth of the sink bowls to be adequate for your kitchen clean up purposes. Types of sinks: Sinks are manufactured for various installation applications: top mount, undermount, farmhouse, and self-rimmed or integrated in the countertops. Sink materials: You will also want to consider the various types of sink materials that are available: natural stone, quartz, granite composite, solid surface, plastic, stainless steel and cast iron or steel covered with baked porcelain. All these decisions have cost implications. There are advantages and disadvantages for each decision. Let’s examine each of the variables separately in order to help you make your the decision. Generally, kitchen sinks are one, two or three bowls. Some double sinks have the large bowl on the right while other sink manufacturers have the large bowl on the left. The size and depth of the sink bowls vary greatly, and some sink drains are installed in the back of the bowl while others are more centrally located. In a three-bowl sink, the third bowl is usually allocated to the garbage disposal exclusively. Top-mounted, under-mounted, self-rimmed or integrated sinks, and farmhouse sinks are used throughout the kitchen and bath industry. The type of sink depends on the various countertop materials. Top-mounted and self-rimmed sinks are primarily used with laminate countertops. Top-mount is the least desirable type of sink because the lip around the top edge of the sink protrudes above the countertop material and requires constant caulking and cleaning. The lip inhibits the water on the countertop from easily being pushed back into the sink bowl. Solid surface sinks are usually integrated in the solid surface countertop materials. There are no seams for bacteria and germs to grow, and if the sink bowls or countertop materials are ever damaged, a trained service technician can repair the problem easily. Under-mount sinks are generally made of the following materials: stainless steel, natural stone and quartz composite. 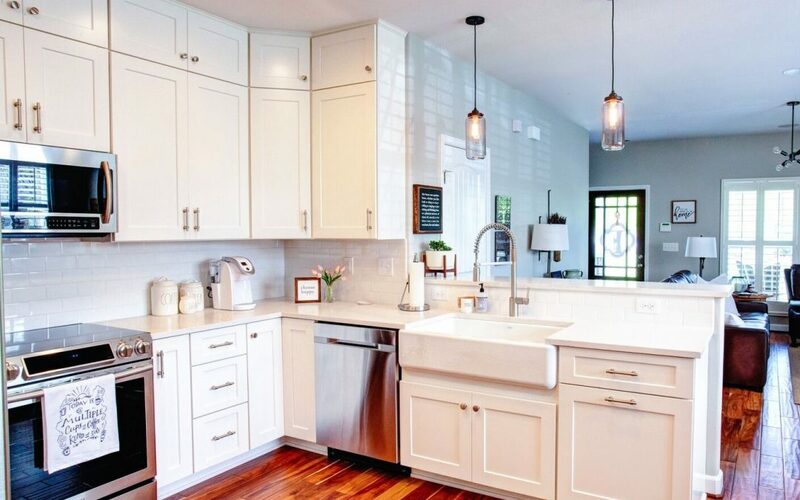 The inside edge of the countertops around the sinks is polished, and the sink is mounted under the countertop with glue, bolts or sometimes both. Sometimes the sink is too heavy to be hung and a substantial frame has to be constructed to hold the sink in place. Farmhouse sinks require a farmhouse sink base cabinet to be installed due to the configuration and weight. The sink can be made of stainless steel, natural stone, quartz composite or cast iron. Natural stone sinks are rocks made of granite, marble, limestone, and soapstone and are cut out from the earth, polished and truly works of art. Natural stone sinks have been used since ancient times and remain the material of choice for many cultures. There are various qualities of stone products in the marketplace today. It is wise to have an expert assist you with your stone sink selection because there are some stone formations that are better suited for sinks than others. Advantage: The material is beautiful and also very durable if it is maintained. Disadvantage: It can be expensive, heavy, easily broken in shipping and installation and may stain more easily because of the fissures and pores in the rock. Natural stone usually needs a moderate amount of maintenance and could break if exposed to extreme temperature changes like pouring boiling water in the sink. It is also an extremely hard material that could break glasses and dishes more easily than other types of sink materials. Granite and quartz composite sinks are manufactured with 93% natural stone that is ground up and mixed with 7% acrylic compound. It is then poured into sink molds for a variety of sink applications. This is the newest type of sink material that was first introduced at the 2003 National Kitchen and Bath Show (NKBA). Advantages: Moderately priced, warranted for ten years, functional, easy to maintain as it has no fissures or pores for bacteria, germs or stains to develop, lasts forever and remains beautiful, durable as it is basically a stone material that can take temperatures up to 400 degrees without any problems. Each sink model can be installed as a top mount or undermount installation. The quartz sinks come in three colors. Solid surface composite sinks are manufactured materials that are made from either acrylic or polyester compounds. These sinks are manufactured under such names as Dupont Corian, Hi Macs, Avonite, Surell, Fountainhead, and Gibraltar and can be integrated or fused into the counter tops of the same material without seams between the sink and the counter material. Some solid surface manufacturers produce top mount, under-mount and integrated sinks in several colors that match or contrast the counter tops. Advantages: Solid Surface Composite sinks are moderate in cost, more functional with a softer material than the stone products mentioned above, easier to maintain as the material has no fissures or pores for bacteria, germs to grow, stains can be easily removed with a Scotch-brite pad. Most manufactures warranty their materials for ten-years; however, the sinks will never wear out and always remain as beautiful as the day they were installed. Disadvantages: Can be harmed if exposed to hot temperatures (hot grease or extremely hot pots and pans may burn the surface); however, it can be repaired on site with professional assistance at a moderate cost. Stainless steel sinks are manufactured by several U.S. plumbing manufacturers and some other brands are imported into the U.S. market place. The thicker gauge sink materials (usually at least 18 gauge), the polish of the stainless steel, and the depth of the sink bowls usually influence the price. Many manufactures coat the bottom of the sink bowls to deaden the sound. Advantages: Stainless steel sinks can be priced as low, moderate or high and are generally dependant on the thickness of the material. It can be cleaned more easily than other types of sink materials depending on the quality of the stainless steel. It is made of a lighter weight for ease of installation and is attractive because it can match other stainless steel appliances and is also not affected by hot liquids, objects or hot grease. Disadvantages: Stainless steel sink material can be dented or scratched, requires constant cleaning as water spots show up unless cleaned and polished, and the scratches create fissures and pores that can hold bacteria and germs. Some stainless sinks are manufactured so thin that is difficult to attach a garbage disposal or install the sink baskets. Cast iron sinks have been manufactured here in the U.S for the past 150 years and have served us well. They are molded out of cast iron and covered with a baked-on porcelain material. These sinks are made for top mount, self-rimmed and under-mount installation. Advantages: Moderate cost, attractive when newly installed, great longevity if maintained, holds the heat when washing dishes and not affected by hot objects or grease. Disadvantages: Heavy to install, porcelain can be chipped if hit with a hard object and the porcelain surface may wear away or stain over times, may require constant maintenance and the scratches may hold bacteria and germs. Steel sinks are generally considered one of the least expensive sink products and have been with us for the past seventy-five years. They are pressed out of steel and coated with a baked on porcelain material. They are usually top mounted or self-rimmed installed. Advantages: Low in cost, light in weight, relatively easy to install and not affected by hot objects or grease. Disadvantages: porcelain can be easily chipped if hit with a hard object or porcelain surface may wear away over time causing it to rust, stains easily, loses heat of the water when washing dishes and scratches may hold bacteria and germs. Now that you know the advantages and disadvantages of the sink configuration, types of sinks and the sink materials that are in the market place, it should be easier for you to make a good, educated decision.